Professor Ian McLoughlin, Head of School (Medway), on the changing ways in which we can use technology to identify ourselves. This article was originally published on The Conversation. Read the original article. But does this kind of technology really mean that you’ll soon be able to just forget your passwords? The short answer right now is “no”. Banks are adopting voice recognition technologies (often known as “speaker identification” in research literature) and face recognition primarily for verification, not identification. 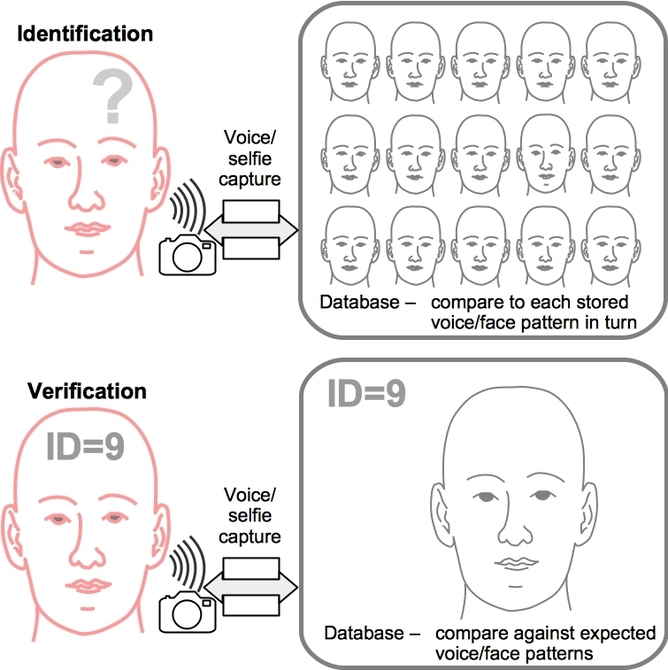 These technologies are a reasonable tool for verifying a person is who they claim to be because machines can learn how one person normally speaks or looks. But they are not yet good methods of identifying a single customer from the very large number of possible voices or faces a bank might have in their database. For voice identification to work, the difference between your voice and others’ (inter-speaker variation) must always be greater than the difference between your voice now and on another occasion (intra-speaker variation). The same is true with “selfie recognition”; you need to look more like the normal you than anyone else does. In practice, this doesn’t always happen. The more voices or faces a system compares, the more likely it will find two that are very similar. The consequence is that banks have a fair chance of “verifying” that a caller or selfie-taker is who they claim to be, but not of “identifying” an unknown voice or selfie. So we will still need a way to identify ourselves for the foreseeable future, and the best method remains a secret PIN or password. Other researchers are investigating the biometric potential of capturing an individual’s unique brainwaves with a headset or, more recently, with earphones. But such technology is in its infancy. Imagine walking into a bakery and picking up a crusty farmhouse loaf. You take it over to the baker and say “I would like to buy this, please.” “That will be two pounds, do you wish to proceed with the purchase?” replies the baker. “Yes, please proceed,” you say, and wait for their “Okay” before walking out with your loaf. No cash, no payment card and no personal details divulged. It might sound like a scene from a bygone era when you knew your local baker and maintained an account with them. But it is, in fact, a future that researchers are working hard to enable. Your smartphone will employ voice authentication and speech recognition technology to authorise the payment with your bank who will confirm the transaction electronically with the baker. Meanwhile, a point-of-sale video recordingof the transaction will be lodged with both your bank and the bakery. So while you shouldn’t throw away your passwords just yet, you can expect some exciting developments in this area over the next few years. This entry was posted in News, opinion, security and tagged Ian McLoughlin, security, selfies, the conversation. Bookmark the permalink.